…from one friend to another. 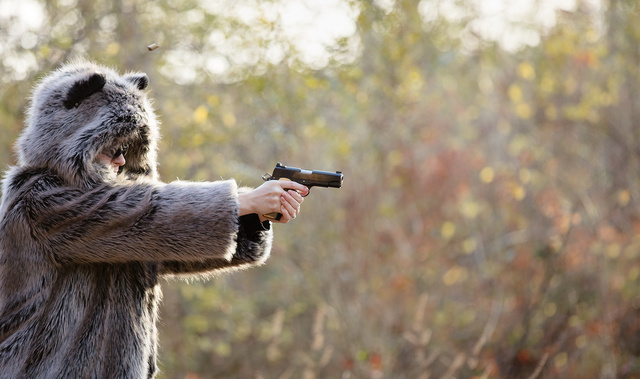 Gray Wolf Hoodie, formerly Red Riding Hood, test fires her present. 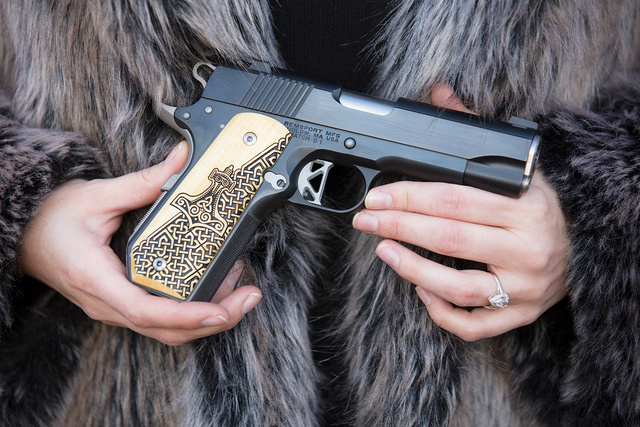 This entry was posted in pistol and tagged 1911, 45ACP, custom. Bookmark the permalink. Nice! I love the grips with the symbol for Thor’s hammer. Are they ivory? I had those same Esmerelda grips on Kimber Ultra Elite that got stolen a few years back. One of My favorite grips from Esmerelda, Ivory wood. The other I have are Celtic cross on one of my highpowers. Only thing I would put on one of my blued builds. Am partial to Wicked grips on the stainless guns. The Thor grips are no longer made from what I understand. No longer on her web site. I emailed her to ask if she still made them, but haven’t got a reply yet today. “Formerly Red Riding Hood”, as in your photo of a well armed RRH? That’s one of my favorites.